Let me know what you would like by clicking on the "Request Custom Order" button and describing your idea the best you can. We will collaborate on your project together! Pricing starts around $50 (plus shipping), and will depend on your needs, the type and shape of the wood chosen, size, live edge, how much finish is required etc. 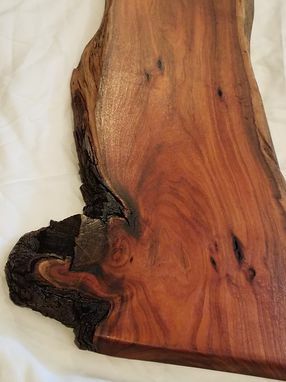 For example; this incredible solid Acacia (rare to find), live and natural edge cutting board & serving platter measures 12 x 24 x 1" and is available now for a steal at $95, plus shipping.